In this article we will learn about REST Architecture elements and REST Constraints. scheme - It is the protocol you are using to communicate with. For RESTful web services, it is usually http or https. port - This is optional and which is numeric The host and port represent the location of your resource on the network. path - This expression is a set of text segments delimited by the “/” character. Think of the path expression as a directory list of a file on your machine.
? - This character separates the path from the queryString. fragment: It is delimited by a “#” character. The fragment is usually used to point to a certain place in the document you are querying. REST constraints are design rules that are applied to establish the distinct characteristics of the REST architectural style. If you follow all constraints designed by the REST architectural style your systems is considered RESTful. Note: Concerns are the different aspects of software functionality. For instance, the "business logic" of software is a concern, and the interface through which a person uses this logic is another. The separation of concerns is keeping the code for each of these concerns separate. Changing the interface should not require changing the business logic code, and vice versa. 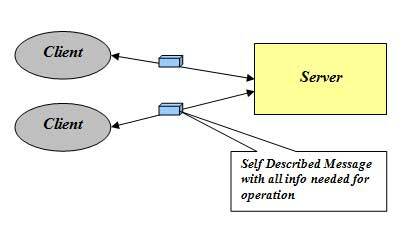 Model-View-Controller (MVC) design pattern is an excellent example of separating these concerns for better software maintainability. The notion of statelessness is defined from the perspective of the server. The constraint says that the server should not remember the state of the application. As a consequence, the client should send all information necessary for execution along with each request, because the server cannot reuse information from previous requests as it didn’t memorize them. All info needed is in message. Server does not have to manage resource usage across requests. REST includes cache constraints so that the "second fetch" doesn't have to be made at all if the data is already sitting in your local cache (or can be a request that only uses partial network resources if the cache is an intermediary or server-side). If your data can be designed in such a way to take advantage of this, you can reduce total network traffic by orders of magnitude. Data within a response to a request is implicitly or explicitly labeled as cacheable or non cacheable. Improves efficiency, scalability and user perceived performance. The uniform interface constraint at a high level means the interface for a component needs to be generic as possible. It simplifies and decouples the architecture, which enables each part of the architecture to evolve independently. 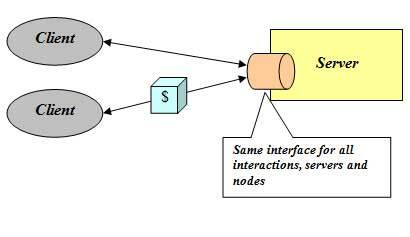 Overall system architecture is simplified and the visibility of interactions is improved. Implementations are decoupled from the services they provide and encourage independent evolvability. Trade off: Degrades efficiency since information is transferred in a standardized form rather than one which is specific to application's needs. Note: Proxy is an intermediary selected by a client, to provide interfaces to services like data translation, performance enhancement, or security protection. Gateway is an intermediary imposed by the network or origin server to provide an interface encapsulation of other services, for data translation, performance enhancement, or security enforcement. Placing shared caches at boundaries of organizational domain can result in significant benefits. Can also enforce security policies e.g. firewall. Trade off: Adds overhead and latency and reduce user perceived performance. Code on demand is an optional constraint. It allows a client to download and execute code from a server. Simplifies clients, hence promotes the reduced coupling of features. Trade off: Reduces visibility generated by the code itself, which is hard for an intermediary to interpret. This article tried to explain the architectural elements of REST and REST Constraints concisely. Hope you likes the article.